The theme for tonight’s dinner is light and simple since it’s a running night. Last week I went on a potato buying binge grabbing a few different types that looked appealing to me. 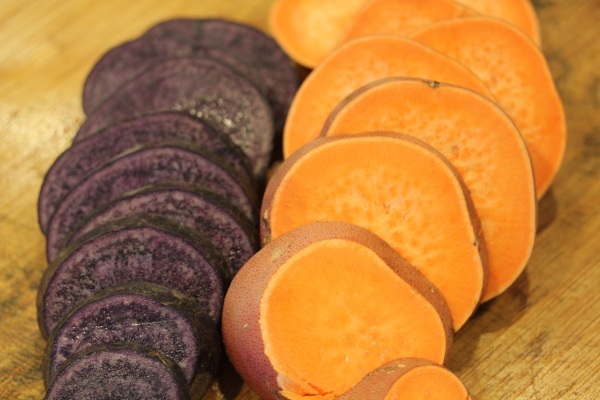 Problem is I haven’t been using them fast enough and grabbed two for tonight’s dinner, a Peruvian Purple Potato and sweet potato for colorful baked potato rounds to go with a raw soup. 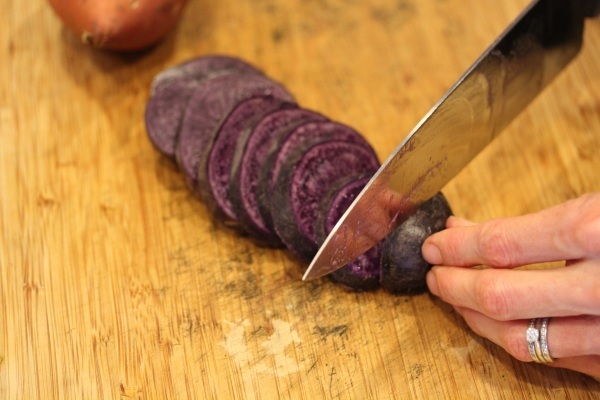 The purple potato is gorgeous almost looking like a beet when sliced into and, unlike white potatoes, rich in antioxidents. I just love the colors of these two paired together. I tossed the rounds in a bowl with a little coconut oil and salt. 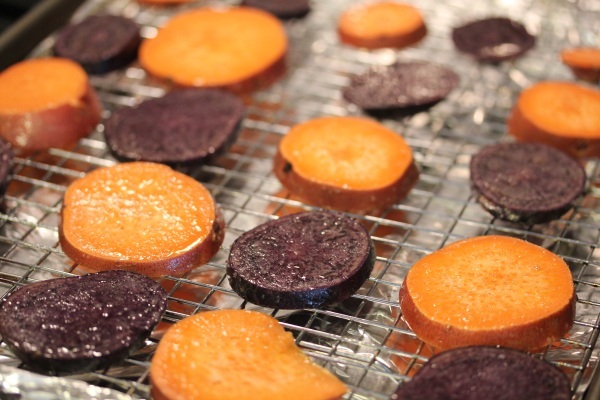 Then lined them on a baking grid to bake at 375 degrees for about 35 minutes. 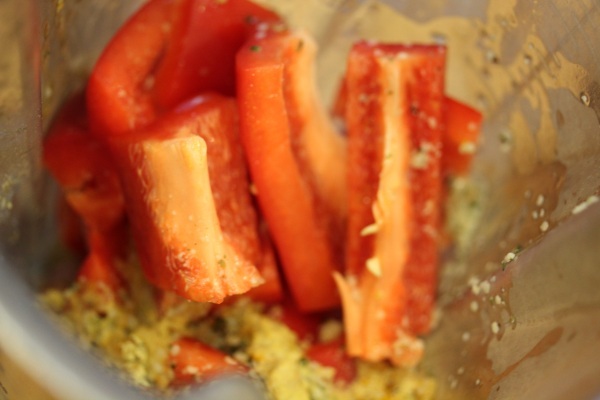 Then I prepared one of my favorite raw soups in the Vita-Mix – Gena’s Red Pepper and Hemp Soup. 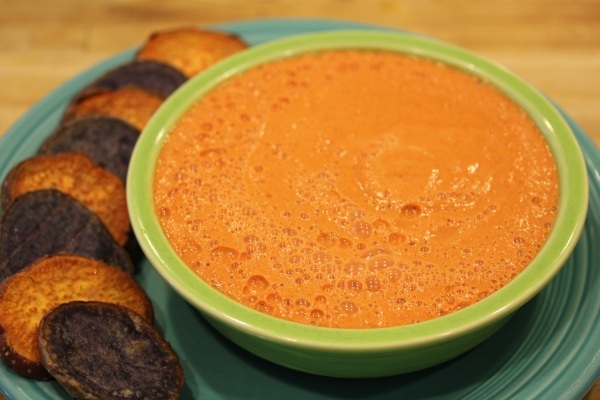 I make this soup so much, it has a page in my internet recipes binder. But I didn’t blend it just yet, instead I cleared the kitchen and parked it on the couch catching up on a little blog reading for 30 minutes while hubby had a turn in the kitchen to prepare the rest of his dinner. Occasionally I let him have a turn. Since we prepare different meals a lot (non-vegan for him), we have to plan our entrees to be ready about the same time. 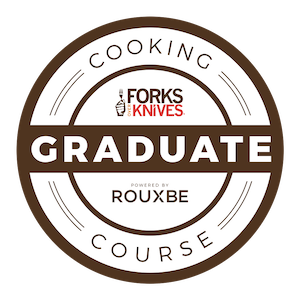 That’s usually easy with raw dishes since they can chill in the fridge, warm in the dehydrator, or sit out and get room-temperature while he’s cooking his stuff. 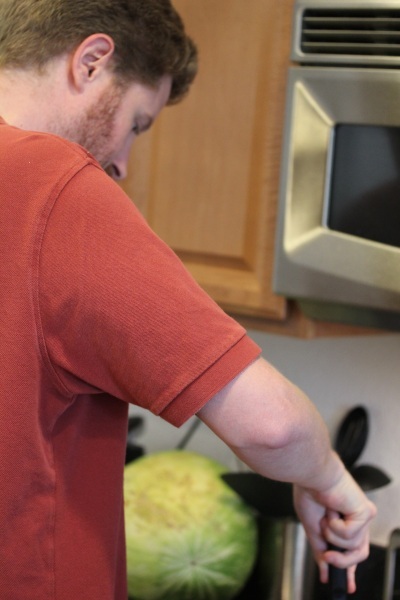 But it can be tricky when we’re baking, or I’m starved after an early lunch at work and he wants to roast something. Anyway, once his stir fry was ready, my potato rounds were also ready. 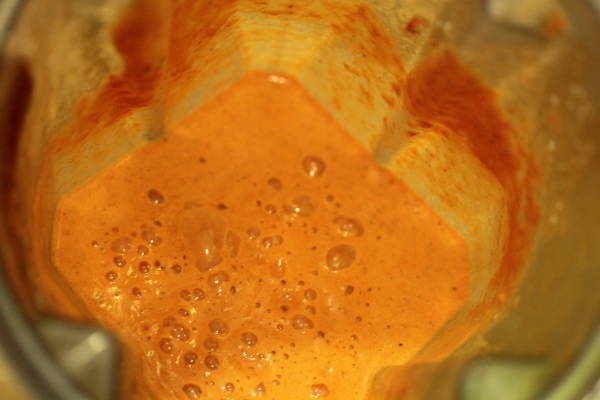 So I blended the soup in the Vita-Mix. And served my colorful dinner. 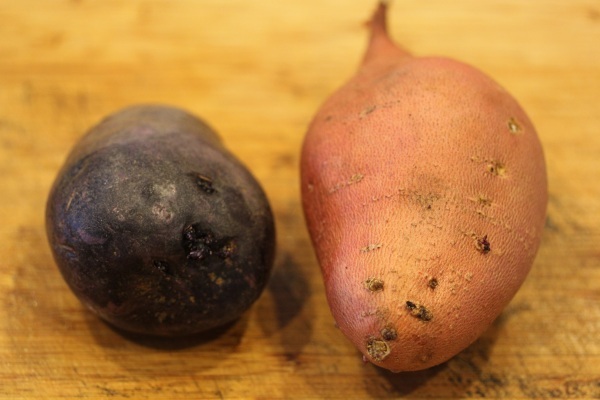 The purple potato paired nicely with the sweet potato tasting a lot like white potatoes. 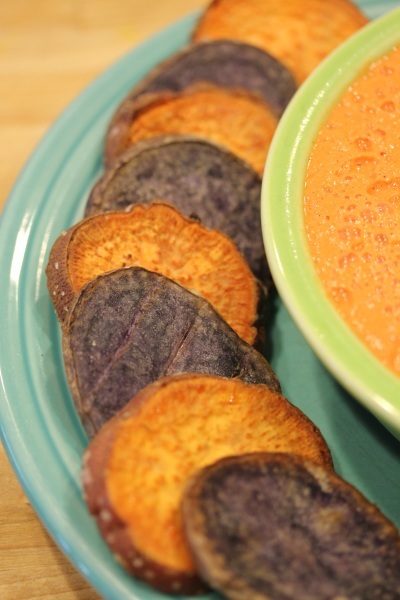 But the color made it more fun and cheery to eat while knowing they had more nutritional value was comforting. And the soup was wonderful as always. I make this soup so much, it has a page in my internet recipes binder. = I LOVE that binder! It’s a blend of new school internet meets old school recipe cards. I must do this to stay more organized. 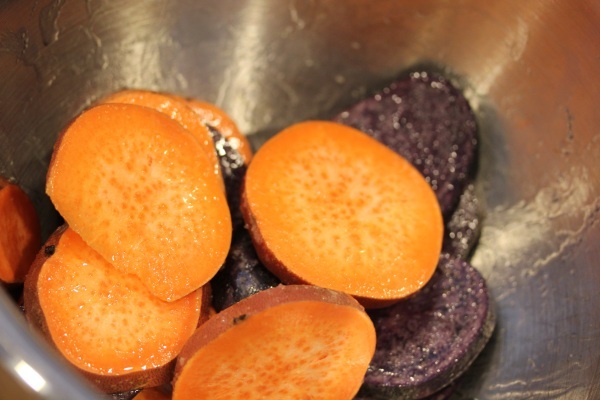 Purple taters with coconut oil! I have a recipe for that, too. 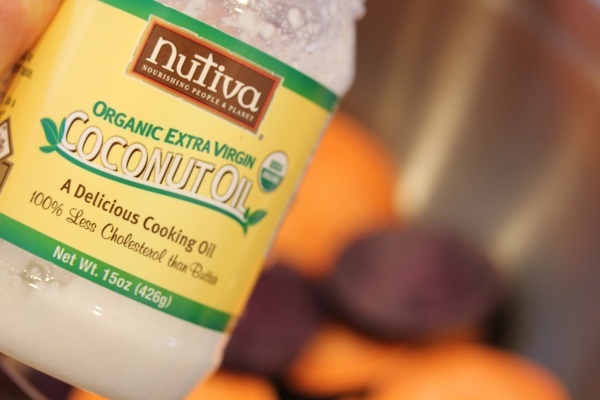 I also use ground ginger but it’s really the coconut oil that takes over and makes the recipe. And the soup. Awesome looking. Reminds me of the start of my kale chip coating, taken in a diff way. I must try it. I cant live without my recipe binder =) I just organized mine yesterday to weed out the stuff I just wont make and add some stuff i haaaavve to make! your dinner makes me want a second dinner… at 2 in the morning =) bah why am I up!? The colors of your dinner are lovely! You and I have the same kitchen situation! LOL My husband make his own (non-vegan) meals as well so it’s sort of a running joke when one of us says “What’s for dinner?” Which really means..what are YOU having? Then we decide what we can make and share together and what we’re making on our own. It works. I need to make a recipe binder, great idea! I try to time dinner with Mike and Anthony too, since they eat different than me! loving these potato round yummies!! love this meal! 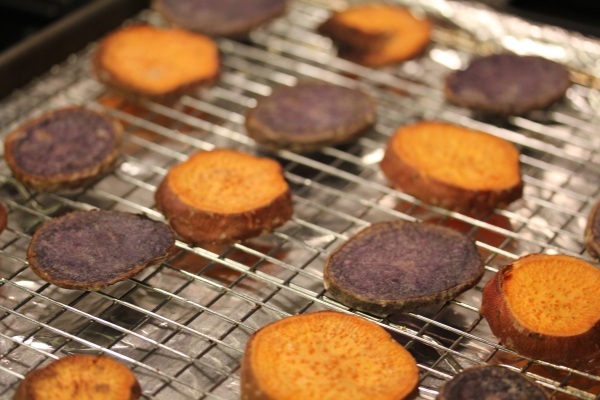 good idea to use coconut oil with the potatoes. i will do that next time instead of olive oil. 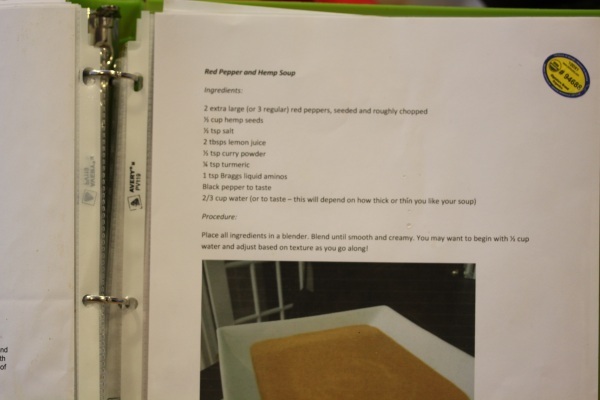 I have a binder full of internet recipe printouts too. I think you need to pan-fry some squash blossoms and put them on top of one of your great looking salads!